Amazon has announced a new deal with Paramount that will see hundreds of its hit movies coming to Prime Instant Video for free. This newest deal for Amazon will see them once again increasing the size of the catalog the company offers as a free perk to its Amazon Prime members. What started off as an “all-you-can-eat” shipping solution hat cost $79 a year now includes thousands of movies, TV episodes and lendable books. It’s still unclear what the end game is, but for now, the benefits one gets for that price are pretty substantial. Some of the titles you can expect to see being added over the coming weeks include Top Gun, Braveheart, Mean Girls, Breakfast at Tiffany’s and many more. The press release states that titles will be rolling out over the next three years, but it is unclear if that means more titles will be announced down the road or if this rollout will be done in phases. Any way you slice it, you’ve got a ton of content you can enjoy for not a whole lot of money per year. SEATTLE–(BUSINESS WIRE)–May. 23, 2012– (NASDAQ:AMZN) – Amazon continues to invest in Prime Instant Video and add to the already-vast selection of movies and TV episodes available to customers as part of their Prime membership. Amazon.com, Inc. today announced a licensing agreement with Paramount Pictures that brings hundreds of new hit movies to Prime Instant Video in the U.S. over the next three years. Prime Instant Video now offers customers more than 17,000 movies and TV episodes to enjoy. 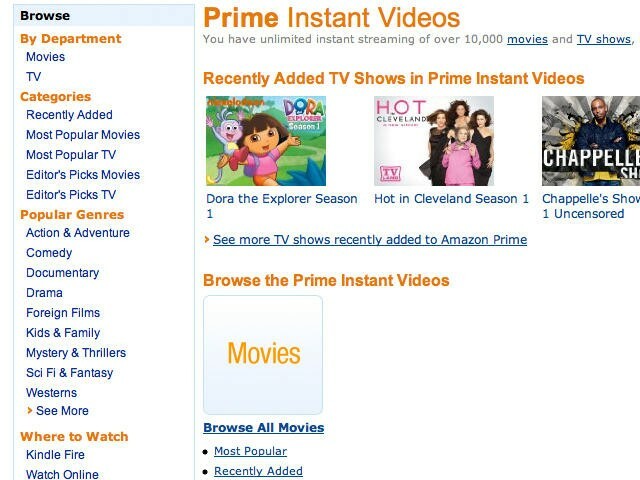 To start watching Prime Instant Video immediately, visit www.amazon.com/piv. Customers who are not Prime members can enjoy a free one month trial of Prime. Prime customers can enjoy Prime Instant Video on Kindle Fire or any of the hundreds of compatible Amazon Instant Video devices, including PlayStation 3. For a list of compatible Amazon Instant Video devices visit here. Amazon Instant Video is a digital video streaming and download service that offers Amazon customers the ability to rent, purchase or subscribe to a huge catalog of videos. Customers can choose from more than 120,000 titles to purchase or rent and content ranges from new release movies to classic favorites, major television shows, entire seasons, or even day after air TV. Prime Instant Video is Amazon’s video subscription offer—it includes more than 17,000 movies and TV episodes selected from the full assortment available at Amazon Instant Video. This subscription offer allows US Prime customers to stream as many Prime Instant Videos as they like, at no additional cost.